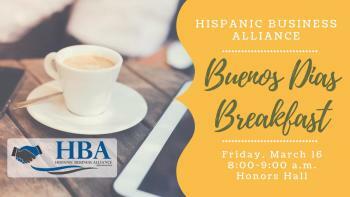 New Braunfels Hispanic Business Alliance will host its first Buenos Dias Breakfast on Friday, March 16 from 8:00 to 9:00 a.m. at the Chamber in Honors Hall. Attendees will enjoy a light breakfast, hear a few HBA updates, and then guest speaker Chris Looney, City of New Braunfels Planning Director, will provide a presentation on the City’s Comprehensive Plan. You do not have to be a member to attend. The mixer is open to everyone – individuals, businesses, corporations – so bring a friend, client or colleague with you. FREE to attend for HBA members and $5 for non-members. Payment will be taken at the door via cash, check or credit/debit card. Breakfast is provided and sponsored by Lux Funeral Home. Questions? Email Jenna@InNewBraunfels.com. Follow the Hispanic Business Alliance on Facebook for up-to-date information and news. Buenos Dias Breakfasts will be held on the third Friday of every other month (March, May, July, September, and November).